Growing up my mom frequently filled our home with the delicious sights and smells of fresh baked breads, delectable canned jams, sweet pie fillings, and tasty cookies. 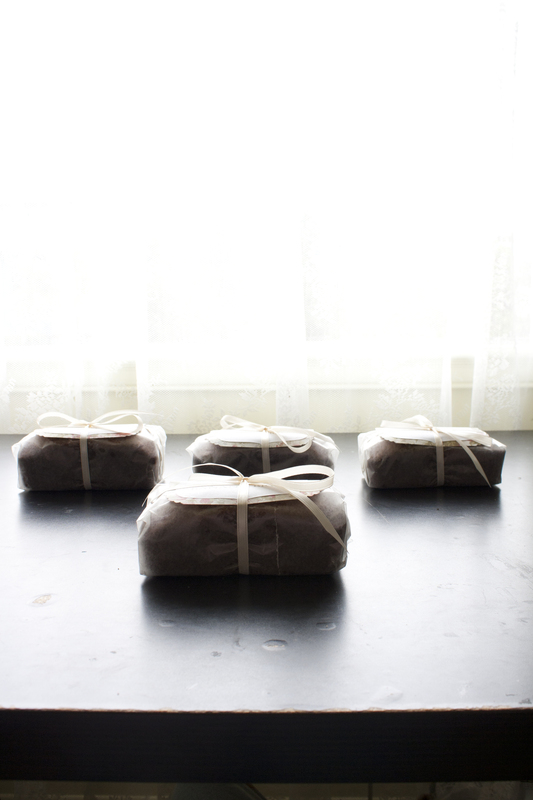 These beautifully packaged goodies were sent off to friends, family, and new neighbors for special occasions, holidays, and just because moments. 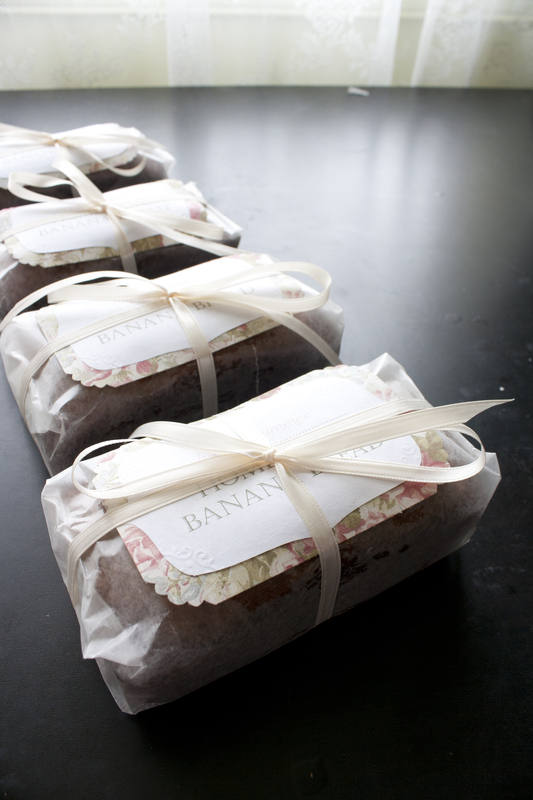 I treasure the memories I have of baking and tasting each batch of homemade goodness, preparing and packaging each bundle with care, and delivering a handmade and very much home loved gift to a friend or family member. So, as a little tribute to my amazing mom, and as a sweet opportunity to bless our wonderful neighbors, Lucas and I baked up a few batches of warm, mouth-wateringly yummy banana bread. In true homage to my childhood memories, I had to package these goodies up with some flare. Enjoy the little “how to” tutorial below, maybe these almost edible photos will inspire you to give it a try and bless someone in your life with some homemade goodness! 4. In a large mixing bowl, combine margarine, sugar and eggs, belnd well. Add bananas and blend well. 5. Add flour mixture to the banana mixture until thoroughly blended. Batter may be lumpy from bananas. 6. Pour into prepared pan or muffin tins. Bake until center is done when checked with a wooden skewer. Muffins and bread will turn a very dark brown. Check center for doneness. Remove from oven and cool for 5-10 minutes before inverting. Ripe bananas can be tossed in the freezer for months, peels and all until ready to use, Just simply defrost. 1.) Make labels. 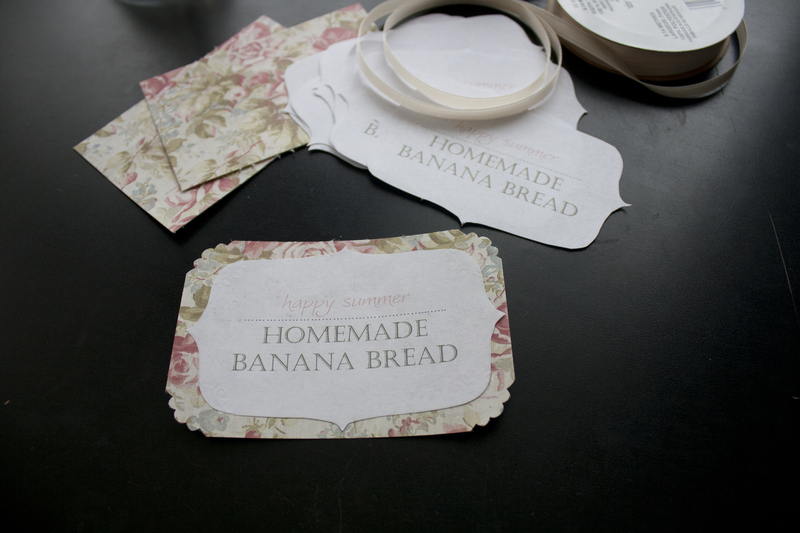 I baked mini loafs for our neighbors so my gift tags/labels measured 2.5” x 2”. I cut the labels to a size I liked atop the loaves but you can make them any size that you like. 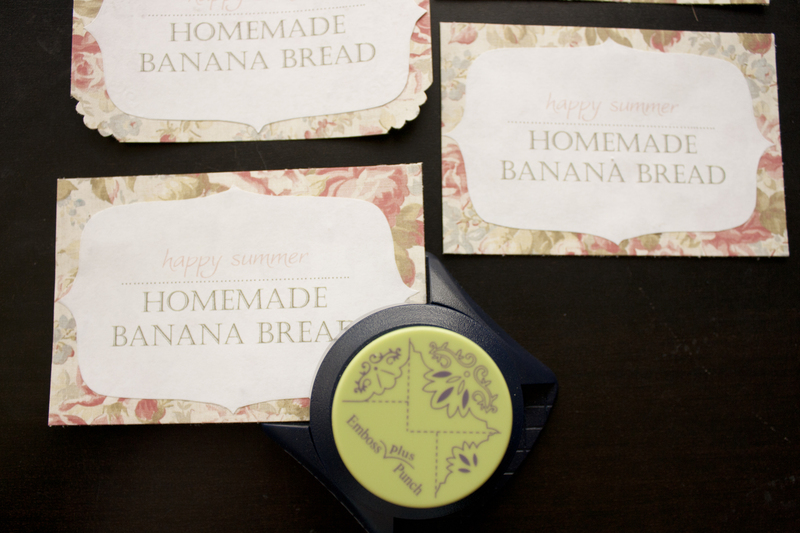 I also pre-printed “Happy Summer: Homemade Banana Bread” using Microsoft Word because I don’t particularly care for my own handwriting. I layered the pre-printed label onto some rose printed paper I had in my stash then punched the corners using my favorite corner punch. 3.) 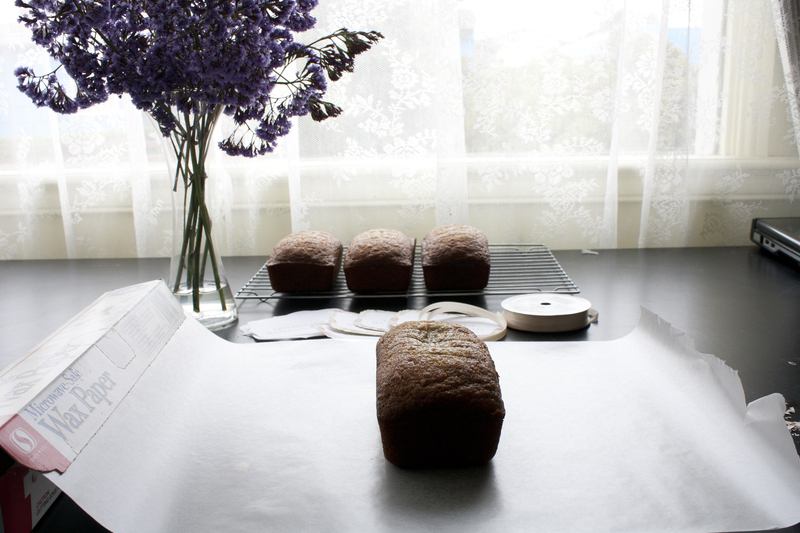 Wrap each loaf in a sheet of wax paper just like you would wrap a gift. 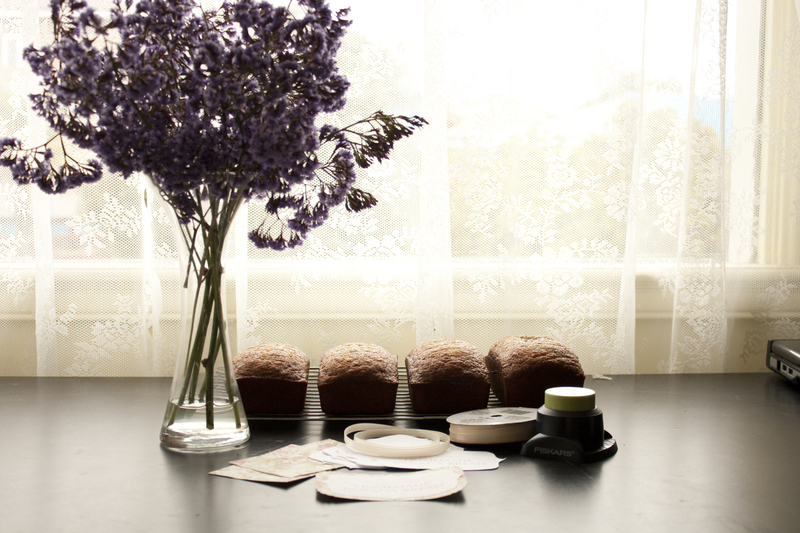 Wax paper is perfect for use as food gift wrap as nothing will stick to it and your loaves will stay perfectly moist in it. 4.) 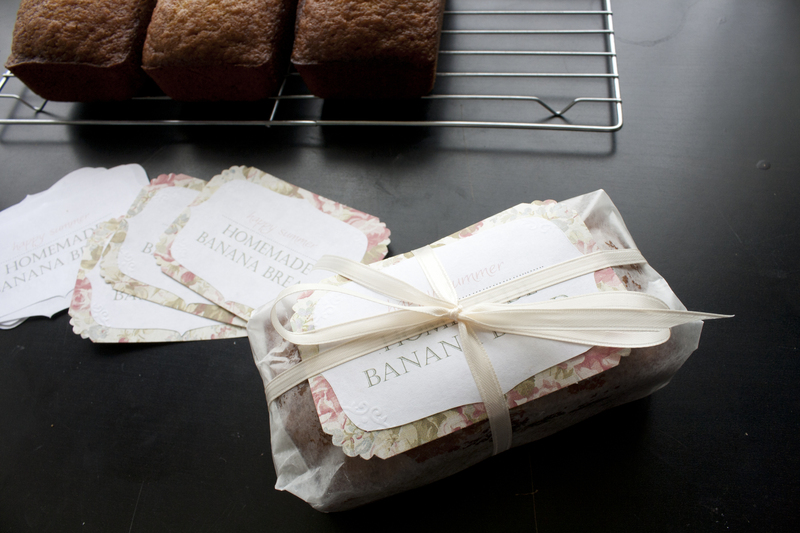 Tie each wrapped loaf like you would a gift and stick your label under the tie to hold in place. 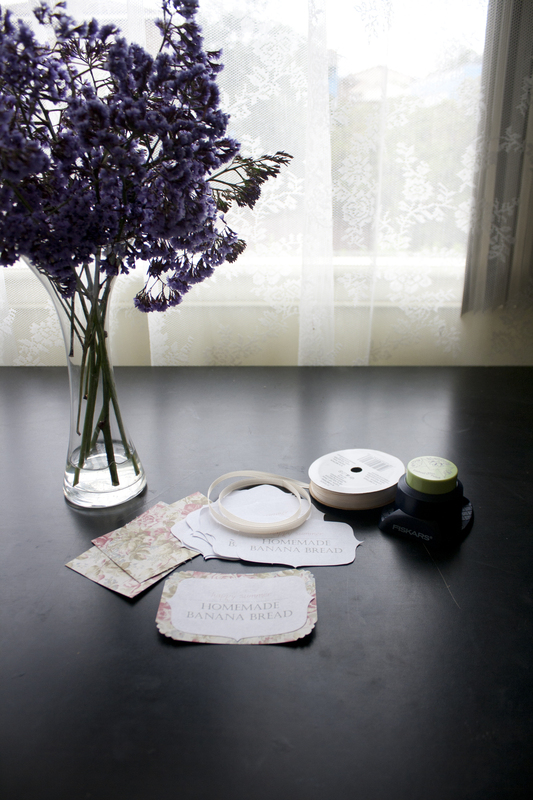 I used some quarter inch ivory satin ribbon but jute twine, thread, or other materials would look equally perfect. 5.) Deliver your packages! Lucas and I walked around our little circle to each of our 3 neighbors homes and handed them each 2 loaves of bread. It was a perfect afternoon of baking with my little guy, sharing special memories, and blessing our neighbors with something homemade. Not a penny was spent to make these loaves as we already had everything on hand- such a small investment in loving on our neighbors. How can you bless your neighbor today? I'm Erika. I'm a very blessed wife and mama: everything else is etc. I like to make things, take pretty pictures, and tell people all about it. Come introduce yourself; I like new friends.